When you’ve found the property you want to buy, it’s important to read the official documents about the property before you make an offer. We recommend you get your lawyer or conveyancer to search the record of title, which is often referred to as a title search. The title will be specific to the property you are buying and has a record of things that can have an impact on what you can do with the property and any access you need to provide to others. 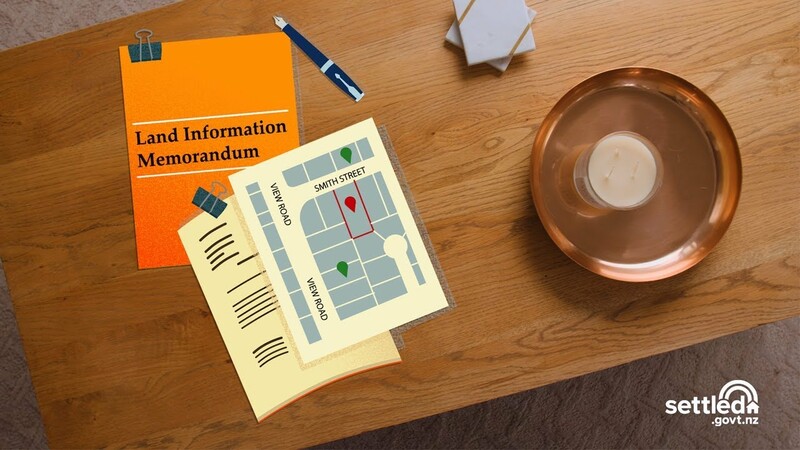 A land information memorandum (LIM) provides a summary of property information held by the different departments at the local council on the day the LIM was produced. It will show you the consents granted for any work on the property and information such as the flood risk for the area and the rates. The LIM will also show whether the property was part of any scheme offered by the council to retro-fit insulation. The property file at the council may contain a lot of relevant information that isn’t on the LIM such as a site plan and the original plans of the house. There are a few websites that will give you an estimate of what a property is worth, but paying a registered valuer will give you an accurate view. If you’re interested in a property that is part of a body corporate, the owner must provide you with a pre-contract disclosure statement, but it is also helpful to obtain additional information such as the minutes from the last 12 months of body corporate meetings. This information on doing your homework may not cover everything that is relevant to you or the property. You should always get advice from your own lawyer or conveyancer and other registered professionals. We recommend you get a title search so that you understand details about the property you are buying that can have an impact on what you can do with the property and any access you need to provide to others. The agent listing the property should be able to provide you with a recent title search. The legal owner of the property (proprietor). This confirms who owns the property and should be checked against who is selling the property. The type of title (estate). This outlines what kind of title it is and on what basis the property is owned. This can affect what you can do with the property and who you have to consult. Read more about types of ownership here. An easement is a legal right to use someone's land for a specific limited purpose. Easements are mainly granted to utility companies to run power lines, water pipes, gas pipes and drains. There may also be easements for anyone else who needs to have a legal right to access the land, for example, a neighbour may have the right to access their property through your driveway. A covenant restricts or allows certain activities on a property - for example, you may not be able to build a house over a certain height, or cut down particular trees. These are common in new subdivisions where the type of house and materials used to build the house are controlled by the owner of the subdivision. A mortgage gives rights over the land to the person/company who has provided a loan for the property. If the loan is not repaid, the entity that holds the mortgage (the mortgagee) will have the right to sell the land to recover their money. A caveat is a notice that someone other than the legal owner is claiming an interest in the land, for example, where a family member has loaned money to buy the property, but hasn’t yet registered a mortgage on the title. If a caveat has been registered, the property owner cannot sell, mortgage or transfer the land until the claim has been resolved. You may find other less common interests on a title. Always talk to your lawyer or conveyancer about what an interest might mean for you. If the property is listed with a real estate agent, they must have a copy of the record of title. Check the date because it won’t show interests registered after that date. If it isn’t recent, order your own copy of the title. If the agent notices any restrictions that may affect you as the buyer, they must pass this information on to you. The agent is not a legal expert so will refer you to get legal advice if there is anything complicated on the title. Your lawyer or conveyancer can do a title search for you, or you can do your own title search. We strongly recommend you ask your lawyer or conveyancer to check the title before you place an offer on a property. You can order a title from LINZ. Some property information is free from some councils online or if you visit the council offices in person. Check with the local council. This is a cheap short-term option that will save you time. But, you won’t learn important information about the property. There is a cost for this. The LIM contains important information about the property. It does not include any building plans submitted to the council for consent. We recommend reviewing the council’s property information along with the LIM. There may not be a cost for this. You may need to go into the council office to look at this information, and there may be a charge for copying it. Some councils make this information available online. If you visit the council office, you may be able to discuss the property information with someone at the council. We recommend reviewing the LIM report along with the council’s property information. Lawyers and conveyancers are familiar with these documents and may see things you could miss. The lawyer or conveyancer is unlikely to visit the property, so it is still important that you inspect the plans and council consent records to check if anything has been added to the property that hasn’t been consented by the council. A LIM is a report prepared by the local council at your request. It provides a summary of the current property information held by the different departments at council on the day the LIM was produced. It does not provide all information on the property, for example, if the council hasn’t been notified of a weathertightness issue with the property, it won’t show on the LIM. Any Heritage New Zealand protection. Zoning - how the land may be used and any conditions that apply. Any other information that the council thinks is relevant. How can I get a LIM? Your lawyer or conveyancer can help you get a LIM or you can get it yourself from the local council. Ask them for an application form or apply via the council’s website. You will need to pay a fee, and the process may take several days. Your lawyer or conveyancer can help you understand the report. The property file may contain relevant information that isn’t on the LIM, including a site plan showing an outline of any buildings in relation to the boundary and the original plans of the house. Look for permissions, building consents or resource consents that relate to the original property and any changes since it was built. Compare what is on the file to how the property looks now to identify any alterations. There should be consents filed in the property file or the LIM for any work completed if consent was required for that work. Completed works are usually required to have a code compliance certificate (CCC), which will also be found in the LIM or property file. Where alterations to the property were carried out without consent or where the council cannot issue a CCC, a certificate of acceptance (COA) may be issued instead. You can ask the seller to apply to the council for a COA. The seller does not have to comply with your request, and the council may or may not issue a COA. The file should also show up old issues such as complaints made by current or past neighbours in the area. Some councils have this information available online, or you can go into council’s office. You may have to pay to view files that have been archived. It may save you time if you make an appointment to meet with a planner and this gives you the opportunity to ask questions. What can the neighbours do that might affect your enjoyment of the property such as increasing the height of their property and blocking the view? Are there any protected trees on or close to the property? Is there anything in the district plan that may affect the property such as a proposed motorway? Are there any applications or proposals for neighbouring properties? For example, a quarry down the road may be proposing to increase extraction which could result in more dust, noise and traffic. If you are planning to build your own house on the land, this is also a good opportunity to ask about which services (water, power, phone, gas) are located near the property. This could affect where you can build, or could add extra building costs. There are a few websites that will give you an estimate of what a property is worth based on the value of similar properties in your neighbourhood. These can be a useful guide, but they don’t show the full picture and should only be used as a starting point to work out the value of a property. They can’t take the condition of the property into account and they may not recognise any improvements made to the property. A rating valuation (RV) - previously known as a government valuation (GV) is completed every 3 years. The RV is used by the local council to determine how much the owner pays in rates. The RV is often unrelated to the final sale price of a property. RVs are often quoted in advertisements from real estate agents. You can ask a registered valuer to provide you with an independent valuation. This service comes at a cost (the price will vary depending on the level of detail), but it will be more accurate. This is because it will take into account (among other things) sales in the area, the type of property and its features and what the house is made of. Your bank may ask for an independent valuation if you are applying for a mortgage. Registered valuers are listed on the Property Institute of New Zealand website. A registered valuer has met the standards and requirements of the Valuers Registration Board and has a current practising certificate. If you’re thinking about buying a property that is a unit title like an apartment or townhouse, the property is likely to be managed by a body corporate. You should understand how the body corporate is managed. Ask for minutes from the body corporate’s meetings and the body corporate’s financial reports and budgets. These will show you how the body corporate operates, any issues with the properties that come under the body corporate and how they were resolved. Always check the body corporate rules and make sure they are in accordance with the Unit Titles Act 2010. Also check that the rules fit with what you are looking for in a property, for example, some rules say you are not allowed pets on the property. Your lawyer or conveyancer can help you understand this and other documents. Some body corporate meeting discussions may be off the record and not recorded. Make sure you ask direct questions of the agent you’re dealing with. You can ask them to approach the head of the body corporate for information. Read more about unit title ownership here. How much you would need to pay for the body corporate levy and how often. What maintenance work is planned in the next 12 months. The funds held by the body corporate. Whether there have been any weather-tightness claims in relation to the property or development you are interested in buying. The pre-contract disclosure statement may not include information about the long-term maintenance plan or whether the complex meets current earthquake standards. You may also wish to see the body corporate minutes.